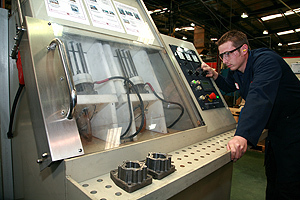 Concentric plc, the world's leading manufacturer of oil, fuel and water pumps for medium to heavy diesel engines, has brought forward the latest phase of its rolling investment programme in order to meet a steep increase in demand from its customers, including Deutz, ZF and Cummins. The current phase of the investment programme is worth approximately £750,000 and will be dedicated to its UK plant in Birmingham. Parallel investments have been committed in the company's other plant in the USA, India and above all China, where a new 40,000 sq.ft. factory is scheduled to start production early in 2007. The Birmingham investment consists of an electro-chemical deburring (ECD) machine and two new horizontal machining centers, one a Mori Seki NH4000 DCG™ and the other an Enshu JE60S 2APC. David Woolley, Managing Director of Concentric Pumps Ltd. commented: "Electro-chemical deburring will release extra capacity from the current facility, and, together with the new machining centers, puts us in great shape for the next round of capacity increases planned for 2007. Planning two years ahead, we can see continuing growth in demand and consequently a vigorous investment programme." The Anotronic ECD machine is designed to achieve even higher standards of accuracy, particularly in relation to fuel pumps. The system employs a highly conductive electrolytic salt solution, with a low-voltage, high-power current passing between a positively charged workpiece (anode) and a negatively charged tool (cathode) that conforms to the edges being deburred. The high rate of electrolyte flow in the tool-workpiece gap washes the chemically dissociated metal ions away from the workpiece before they have a chance to plate on to the tool. Cycle times are short and the bespoke tooling is designed to provide precise access to difficult areas, such as valve port cross-holes. The Mori Seki NH4000 DCG™ system incorporates innovative DCG™ (Driven at the Centre of Gravity) technology, which makes possible rapid acceleration and deceleration whilst maintaining stability to ensure high surface quality. The new machine is expected to reduce cycle time for fuel pumps by approximately 15%, enabling an additional 105 pumps to be produced weekly, per machine. The Enshu JE60S 2APC horizontal machining center is designed for multiple operations on prismatic parts. It is a "full process", high performance traveling-column machining centre, featuring rapid traverse rates, advanced spindle design, fast two-pallet shuttle system and large capacity tool storage. Paul Moseley, Concentric's Programme Manager, commented: "The new machines reflect our policy of continuous investment in the latest and most advanced production facilities. They will help to ensure that Concentric produces pumps of the highest quality, accuracy and efficiency in line with customer demands." Concentric plc is a major supplier to the world's truck, agricultural and construction equipment industries with plants in the UK, USA, India and China. In addition to oil, fuel transfer and water pumps for diesel engines, the group also manufactures lubrication pumps for transmissions and compressors.